Last week, New York’s weather got down to the mid-20s so like any Southern Californian I just layered sweaters, leggings, and anything else I could pile on under my wool coat. I tried to avoid the inevitable – the puffer jacket. My dreaded fear of looking like the Ghostbuster Marshmallow Man or a walking sleeping bag had me holding out. Thus, began my search. I spotted one on a co-worker and had to ask where she got it and surprisingly she said she bought it in California when she was out there on business. Figures. She sends me a link to Macy’s DKNY’s Faux Fur Trim Hooded Quilted Down Coat, but with my luck, the coat only came in white (Glimpse of the Marshmallow Man was staring at me from the monitor). 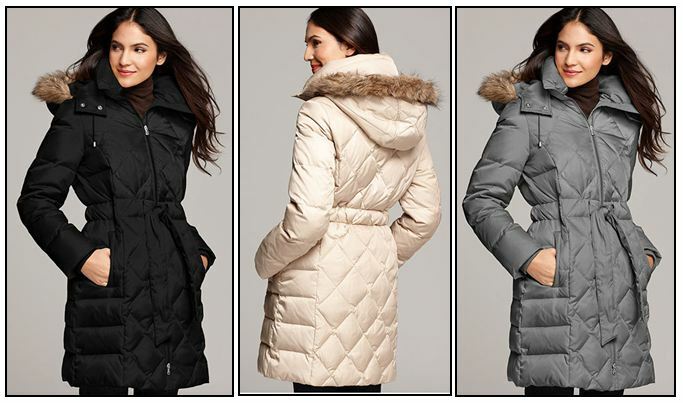 After another hour of shifting through various puffers online and reading reviews, I received my Kenneth Cole Reaction Faux Fur Hooded Long Sleeve Quilted Belted Puffer Coat in Black today! Originally $285.00, it was on sale at Macy’s for $69.99! Score! The instant selling point was that it had a self-tie belt to chinch my waist! No longer a walking sleeping bag! I loved the ribbed knit cuffs to keep the cold out during those morning walks to the subway. I tested it out at lunch today and it was quite cozy. The only thing I didn’t like was that the hood was pretty shapeless so it just slumped on top of my head. Since I got it for a steal, it’s worth to keep! I’ll check it out more when I get home. Who knows, I could be wearing it wrong! Ha! This California girl is learning the winter ropes!